I stopped by a friend’s house recently while she was in the middle of baking something. She had softened her butter earlier in the day and was about to cream it with sugar. Carefully, she peeled the wrapper off the butter, and into the mixer bowl the butter fell. Then, she crumpled up the butter wrapper and threw it away. “Don’t…” was all that I managed to blurt out, but it was too late – the wrapper landed deep in the garbage bin. “What? Why? It’s just a butter wrapper,” she said. A wrapper that’s been generously slathered with softened butter – that could’ve been used for buttering the pan that she was using to bake. When I’m baking with butter, it’s a natural by-product, so instead of softening more butter, I just use what is left on the wrapper and most of the time, it manages to be enough. Plus, it’s a great way to be efficient and frugal in the kitchen. And since Thanksgiving and Hannukah (Thanksgivukah? Hanugiving?) are right around the corner, I suspect there’ll be some baking in your future. 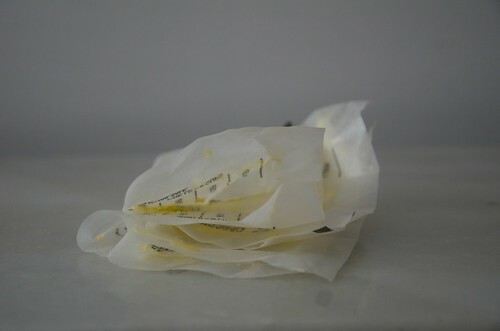 Sometimes, I wind up with more butter wrappers than needed for buttering various pans. When this happens, I fold the wrappers as neatly as I can and place them in a sandwich-sized ziploc bag that is then stored in the freezer until needed. I usually take a wrapper out and let it sit on the counter at room temperature for about fifteen minutes. And if the butter is still not very soft, I usually warm it up with my fingertips. I’ve been doing this for years now and have. But I didn’t think of putting it on the blog until Andrew saw me saving those wrappers and suggested that SR readers might benefit from this tip. Hopefully you will find it useful – let me know if you do – I won’t be offended – really. Such a simple idea but so practical! I’m slapping myself in the forehead for not thinking of this myself. Brilliant tip, Olga! Victoria and Jeanne – so glad I posted it then! Hooray. this is almost as bad as the day Racheal Ray showed me I didn’t have to fight with the plastic wrap anymore. Olga, I believe that you and I could be really good friends if we meet each other in person. This is exactly what I do with my butter wrappers. It’s so logical and so convenient. Sometimes when I’ve collected too many wrappers already and I’m not planning on baking anything soon, I use the wrappers to grease my cooking pans when I need to reheat some meals, its just enough to make the food not stick to the pan. Thanks for sharing. Love tips for using every part of an ingredient. My Mum saves wrappers and then lays them butter side down on top of just cooked rice, pops the lip back on and leaves it 5 minutes before serving. The butter melts through and makes your rice taste yummy. Deepa – that’s such a great tip! Thank you for sharing with all of us. Gayle – glad you liked it. Margarita – Happy to hear you do the same! Sarah O – sorry, what was the RR trick? Been doing that forever. Why waste a perfectly good schmear? You can also use the wrappers to butter corn on the cob. One wrapper is enough for 1 cob in my house. Thank you so much for the tip—never thought of that and glad you did. Brilliant! Lu H. – genius idea. Linda and Tracy – you’re very kind! And you’re welcome! Love the tip! I haven’t tried saving wrappers that go unused, though I love to use them to butter the pan if needed. Thank you! I keep mine in the fridge then use them to butter pans and such! Love it! I do that too! I tuck my baggie of wrappers behind the boxes of frozen butter, that way I know what/where it is! 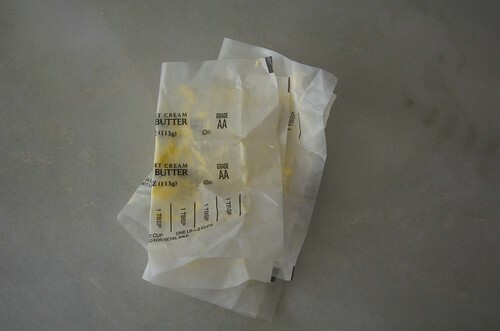 I always save my butter wrappers for future cooking purposes! Hehe, so glad I’m not the only one who does this! I love saving ziplock bags too, they are so darned useful, it perplexes me that anyone would every throw them away. Also flour bags for storing bread.